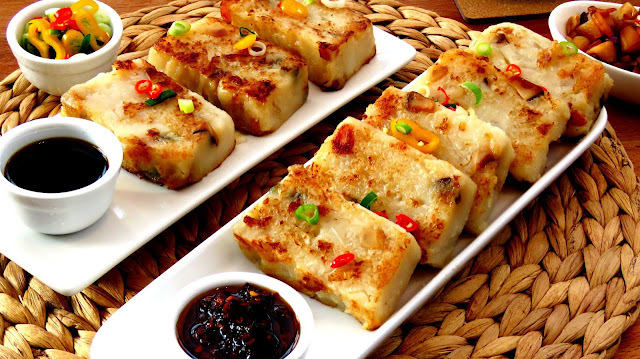 Pan-fried turnip cake has a thin crisp & crunchy layer on the outside from frying, soft on the inside. It is also commonly eaten during Chinese New Year, Since radish 菜頭 is a homophone for "good fortune". 1) Heat and add oil for stir fry (red onions, dried shrimps. dried scallops and dried mushroom till fragrant and until golden brown. 5) Pour the mixture into a well greased foil containers. Cover, and steam for 1 hour. Remove from the heat and set aside to cool slightly. 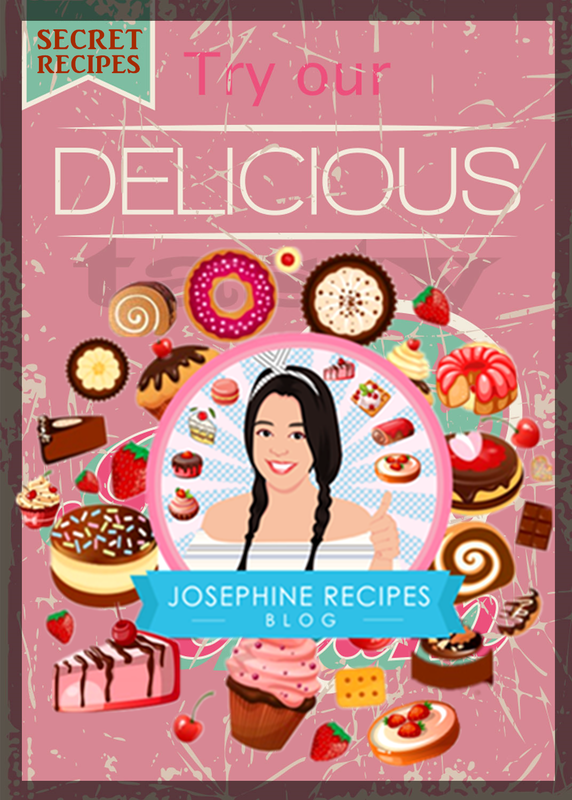 Keep refrigerated and consume within 5 days. 6) Cut into pieces. Heat a pan and oil over a medium high heat. 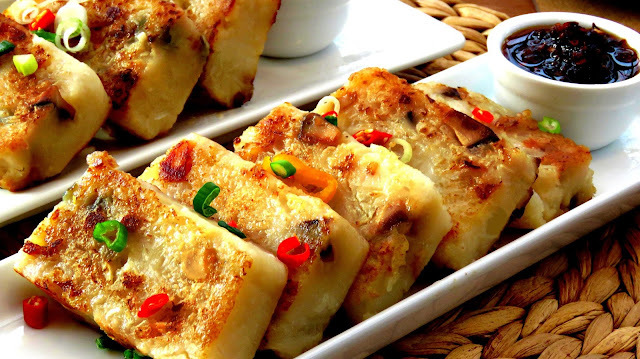 Transfer turnip cake slices one by one to a pan until both side are deep golden brown. Dip into the sauce of your choice. 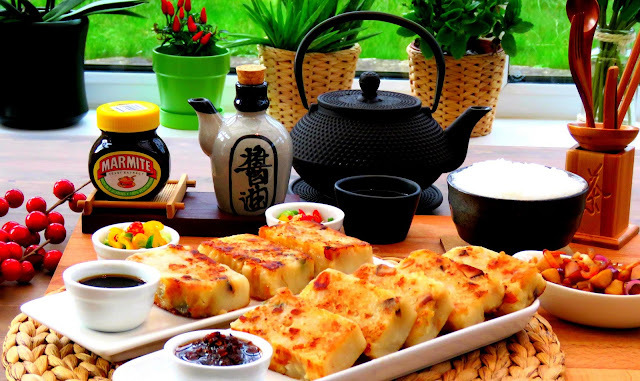 A perfect comfort food with rice porridge and toppings for appetizers. 1) Heat the pan and add oil until medium heat, add scallops and fry about 3 minuts, add brown sugar, fry the scallops until crispy. Put the ''crispy dried scallops'' garnish on top of the turnip cake. 2) Heat the pan without oil, add preserved mooli radish until deep brown and fragrant. then add method (1) pan fried dried and preserved ingredients and mix well together. Serve them with rice porridge and garnish or put toppings on the turnip cake. 1) Turn the heat on high for at least a minute, before adding oil. and mushrooms. It can be increased or decreased to suit your own taste. 3) While you cook the radish as the vegetables will release enough of its own juices, adjust less or more water to make the thin batter. 4) If you want to eat turnip cake straight out of the steamer. It's best to reduce the wheat starch to 5 tsps instead of 5 tbsps. 5) If you really can't find wheat starch, you can substitute cornstarch.